For ebook publishing services, click here. 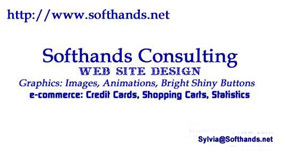 Softhands provides both simple and complex websites. Simple web sites require only a few pages and pictures to advertise a business. Complex sites require programming expertise. Our preference is to use Hostway for hosting services, King-Cart for shopping cart capability, and CardService International for gateway processing. These have been chosen as top quality providers responsive both at setup and for subsequent problems and/or questions. Each web site is treated as a complete business to ensure that the client has thought through the fulfillment process and marketing strategy. The contract provides a six-month maintenance agreement to cover any bugs or difficulties and an optional annual maintenance contract for a separate fee. A statement of work is created for the project, which includes a detailed exploration of the items to be provided and, by whom. There is much content that the client provides that needs to be understood and agreed to in advance. In addition, a detailed schedule is provided. This includes start date, date when all input must be received, code complete date, feedback period, rework as required, and date of installation (go live date). In addition, time is set aside for education and transfer of information via documentation and telephone conferencing. Custom Graphics. Masthead graphic on first page (simple custom graphic incorporating company logo). Top-of-page graphic for all other pages in your Web site. Links to external pages provided on separate web page. Photos and other graphic images supplied by client in addition to masthead and top-of-page graphic. Installation of Web pages on the client's ISP host computer. Site publicity to search engines and directories. Image Map for internal navigation.